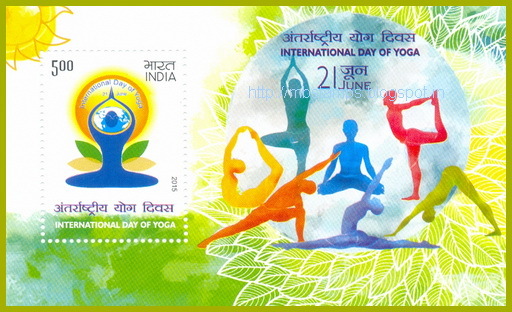 Thanks to PhilatelyNews on Twitter, I've just learned about this FANTASTIC new stamp release from India: International Day of Yoga stamp. June 21 was recently declared International Yoga Day by the UN General Assembly. I may not write about it very often on this blog (if at all? ), but yoga is another of my favorite hobbies, or perhaps better stated, lifestyle and fitness habits; I've been practicing yoga seriously for about 5 years now. So I was extremely excited to see this stamp release that showcases an essential part of India's heritage (and I recognize here that India comprises many different cultures!)... which also happens to be something that has changed my life and health. Also, it's a lovely stamp! I actually like the selvage around the stamp even better than the stamp itself, particularly the colorful representation of the various asanas, or poses. I am also delighted that they kept the figure on the stamp gender-neutral. Yoga is for everyone, and for every body. If any of my blog readers are in India and would be willing or able to send me mail with this stamp, please let me know! I'd love to do an exchange. I'd be so excited to see this stamp in person! Does anyone else know of some cool yoga stamps out there? UPDATE: Philatelist blog-reader Albrecht shared this other yoga series from India, 1991 issue. Albrecht, this is great - thanks so much! I'll update the blog post now. That's great! I just completed my yoga teacher training and have slowly begun to incorporate my yoga teachings into my monthly postcard project. thanks for sharing! Congrats on completion of your yoga teacher training - good luck!